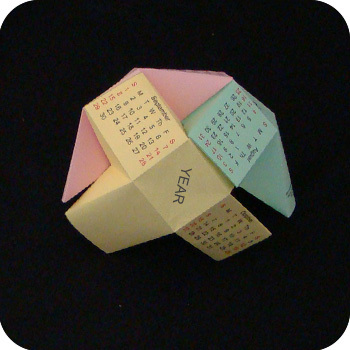 This fabulous origami ball was originally created by Michael Naughton. 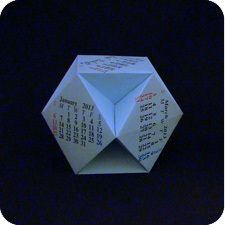 It was converted into an origami calendar by Ilona Täschner. 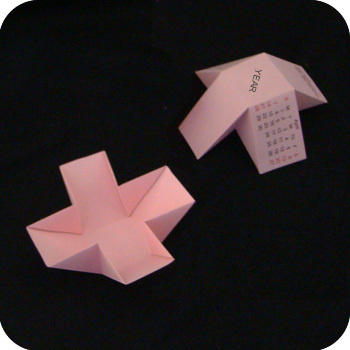 The units are simple to fold and the assembly is obvious but tricky. 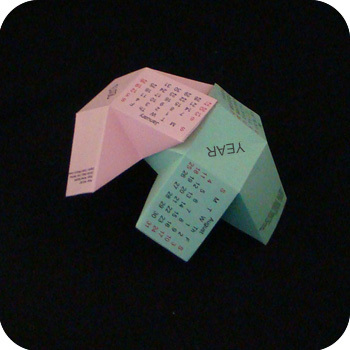 Like most origami calendars, this one is an example of Modular Origami (or, Unit origami). 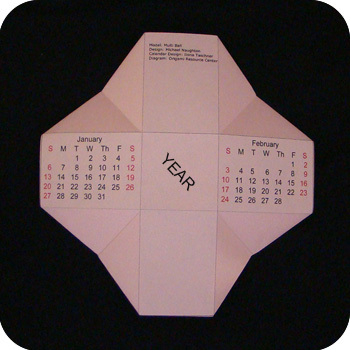 In this example, the calendar is made with 6 sheets of paper. Each sheet is folded the same way and assebled into teh final model. 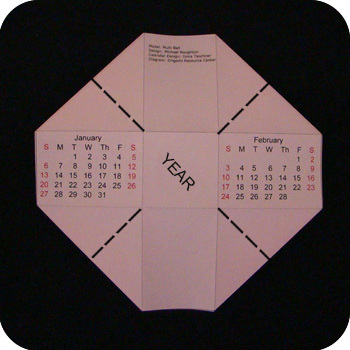 The Multi-Ball Calendar looks great no matter what colors you print the templates on. However, assembly is a little easier if you use 3 colors of paper (2 sheets of each color). Give it a try. There should be six squares (2 months per square). Mountain fold along the vertical and horizontal hairlines. 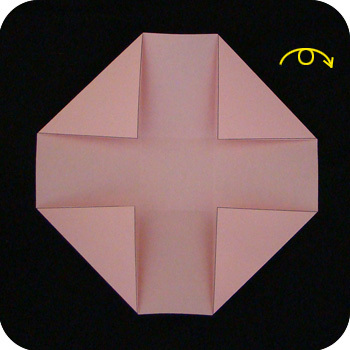 Turn the page over and fold in the four corners. Use crease lines from above as a guide. This is how it looks like. Turn the model over. Valley fold from the corners of the central square out towards to the edge of the model as shown. This is how it looks like. Reinforce the creases so the model is concave like a bowl. Do this for all 6 units. Note how the units have 4 arms. Two of the arms have numbers printed on them (calendar months) and two arms are blank. 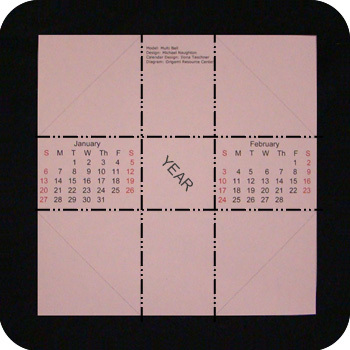 Assemble the model by placing the blank arm of the unit under another unit that has a month printed on it. In this example, the green unit goes under the pink unit. Add the third (yellow) unit by sliding the blank arm under the green arm with the month printed on it. The yellow arm with the date printed on it will go over the pink arm. 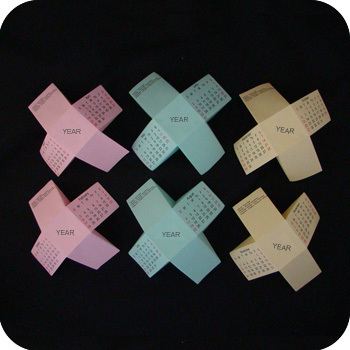 Keep adding units in the same manner: put the arm with no dates on it under the arm with the dates on it. If you used 3 colors of paper then the colors can help you decide which arm to put under and which arm to place on top. 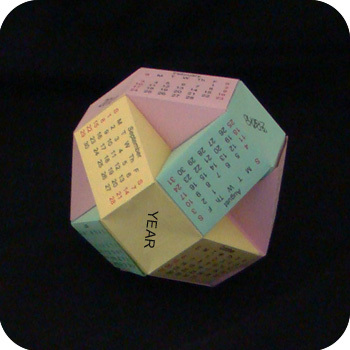 Each dimpled corner of the Multi-Ball calendar should show 3 colors. Ralph Jones has informed us that the Multi-Ball is a modified small rhombicuboctahedron, or a truncated icosidodecahedron. The modification makes some of the original squares into rectangles.